Fintech continues its momentum in Asia. In the first half of 2018, fintech companies in the region raisedUS$16.8 billion in funding with China and India dominating the top 10 deals, and blockchain and artificial intelligence (AI) remaining key priority areas for fintech investors in addition to insurtech and regtech. With many developments taking place in that part of the world from both the public and private sectors, it has become critical for financial professionals to keep up with the rapidly evolving fintech landscape. Hence why, there is an evening dedicated to the FinTech ecosystems in India and Hong Kong organized by LetsVenture, WHub, AngelHub, IndiaTechHK, TiE Hong Kong and Ooosh. 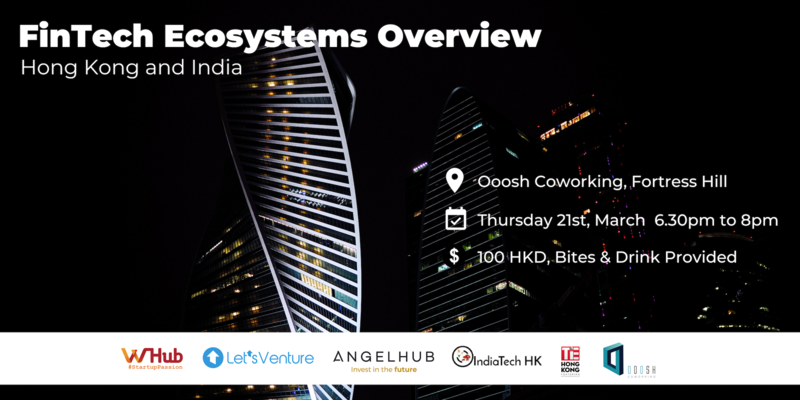 Entrepreneurs, Investors, Ecosystem stakeholders and anyone interested to learn and discover the Fintech ecosystems in India and in Hong Kong. Price: 100HKD per person (includes light snacks and drink) - Limited Capacity. LetsVenture: Network of Angel Investors in India investing in Fintech, Healthcare, SaaS, Enterprise Startups and other sectors. TiE Hong Kong: The Hong Kong chapter of TiE, a non-profit, global community welcoming entrepreneurs from all over the world. Ooosh: A co-working space that provides human-centric Collaborative Workspace Solutions to Startups, SMEs, and larger Corporations.